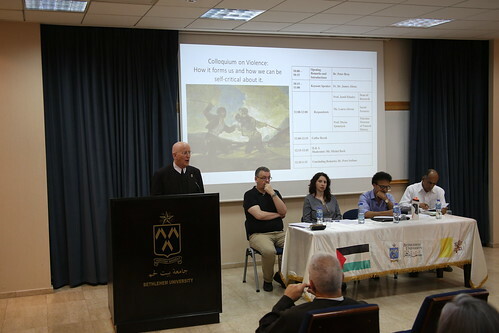 The Office of Coordinator of Institutional Values and the Religious Studies Department held a colloquium entitled “Violence: How it forms us and how we can be self-critical about it” on Thursday, 3 May 2018. Brother Peter Iorlano, the Coordinator of Institutional Values, welcomed the attendees and hoped that the colloquium will enable the audience to reflect on the issue of violence. Brother Peter Bray, Vice Chancellor of Bethlehem University, welcomed the keynote speaker, Fr. Dr. James Alison, to Bethlehem University and hoped Fr. James would share some insights on violence from René Girard to help the attendees use them to understand and cope with the situation here in Palestine. Fr. James Alison began the colloquium by giving a brief introduction to René Girard’s understanding of how humans desire “mimetically” and how this constructs the “Scapegoat Mechanism”. He questioned if, and how, a person can become self-critical with relation to their formation in violence. He discussed four elements which in principle can be accessed in any given modern situation of violence. These are heartbreak, shifting through lies to truth, meaning and meaninglessness, and imagining a new “we”. Three faculty members, Prof. Jamil Khader, Dean of Research, Ms. Laura Adwan, Social Sciences, and Prof. Mazin Qumsiyeh, Palestine Museum of Natural History, participated as the respondents for the event. James Alison is a Roman Catholic theologian and priest. He is noted for his application of René Girard's anthropological theory to Christian systematic theology and for his work on LGBT issues. He is internationally recognized scholar who has published many books.